Hear that roar and rumble? Seafair Weekend brings hydroplane races and Blue Angels aerobatics. Prefer the sea? Check out Navy ships and other vessels on the waterfront. The roar of Blue Angels in the sky and hydroplanes on Lake Washington means it’s Seafair Weekend in Seattle on Friday, Saturday and Sunday, Aug. 5-7. The centerpiece of the Seafair festival since 1950 — and one of Seattle’s biggest parties — features the world’s fastest race boats competing for the Seafair Cup, the Air Show starring the U.S. Navy Blue Angels and festival events in Genesee Park and the surrounding area. Hydroplane-race heats Friday, Saturday and Sunday lead up to the Seafair Cup championship at the end of the day Sunday. Air-show events include U.S. Coast Guard rescue demos, U.S. Air Force A-10 flyovers, Historic Flight Foundation and Flying Heritage Collection vintage aircraft, and the U.S. Navy Blue Angels performing at approximately 1:15 p.m. daily. Bolt on the Blue, a new feature this year, is a water-ski race expo that brings the high-action sport daily to Lake Washington. Time: 8:30 a.m. to 6 p.m. Aug. 5-6 and 7:30 a.m. to 6 p.m. Aug. 7. Festival events at Genesee Park include music, featuring Navy Band Northwest and local bands daily, food vendors with enhanced choices this year including a traditional salmon bake, beverage gardens, hydroplane exhibits, Kids Zone rides, games and chef demos. Spectators sit or stand along the lakeshore or bring lawn chairs and blankets for seating; bleacher seating is available at an additional charge. Bringing food and beverages is fine, but no outside alcohol is allowed. Pets are not allowed. Parking in the area is very limited. Seafair suggests taking Sound Transit Link Light Rail. Free shuttle service is offered daily to and from the Columbia City station. Arriving by bicycle is encouraged, with half off admission and secure parking for cyclists. Admission is free for everyone Friday, and free all weekend for Boeing employees and active and retired military personnel with ID at the main admission gate, with a special $15-a-day rate for military family members. For a close-up look at the hydros and their crews, Pit Pass tours are available for $10; closed-toe shoes are required for pit access. The I-90 floating bridge and several I-90 and I-5 ramps will be closed for safety before and during U.S. Navy Blue Angels practices and performances. Crowds line the shoreline outside the paid admission area to watch the Blue Angels show; note that Seward Park, near the event, is closed for the Blue Angels performances from approximately 1 to 2:30 p.m. Friday, Saturday and Sunday. Prefer really big ships? 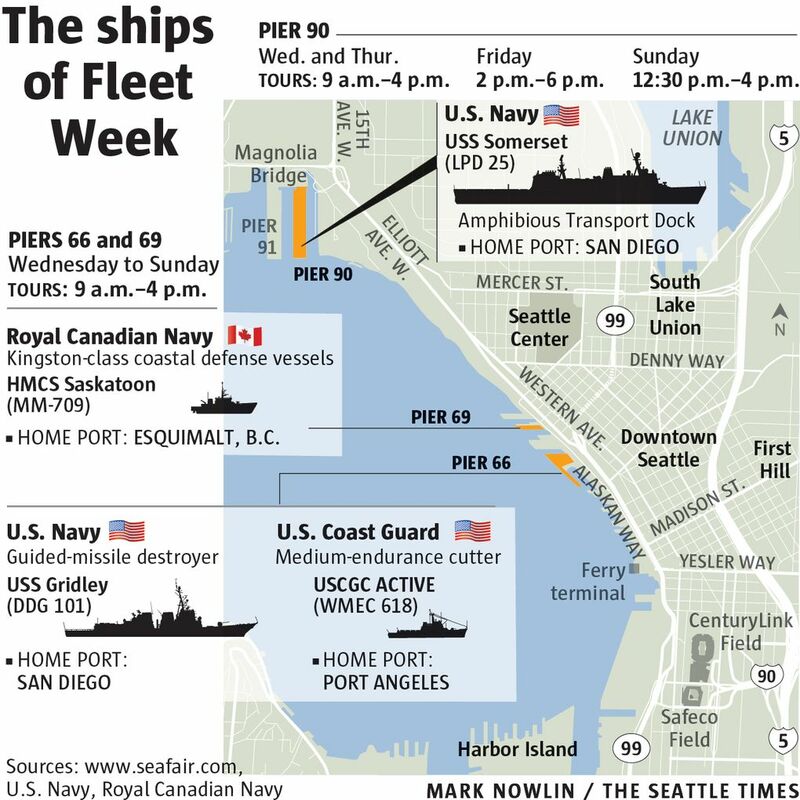 Fleet Week will bring a parade of vessels to the Seattle waterfront, including U.S. and Canadian Navy ships. The ships of Fleet Week will be stationed at Piers 66, 69 and 90 and are available for public tours from 9 a.m. to 4 p.m. Wednesday through Sunday. This year, the USS Somerset, a naval transport dock nearly 700 feet long, will be featured. Information from Erica Pandey was included in this report.